The Western Cape Department of Agriculture (WCDoA), Casidra and other partners recently put back smiles and happiness on the faces of the Murraysburg community. The Rooidam, consisting of two dams, is currently being restored and the irrigation furrow system repaired. The primary aim of the dams was to supply the town with irrigation water, water that was distributed from higher up from the Buffelsrivier to serve as irrigation water for the numerous vegetable gardens that flourished at the time in Murraysburg. The project has been coming on for a few years, but recently due to involvement by the WCDoA’s Director of Sustainable Resource Management, André Roux, and especially Chris Barr, efforts of the Murraysburg Sustainable Development Council (MSDC) has seen budgets awarded and approved for the Rooidam project. The holistic approach towards this project was to look at the benefits that the repairing of the irrigation system for the community of Murraysburg would pose. Over two financial years, savings were made by the WCDoA through its Comprehensive Agricultural Support Programme and eventually the funds were transferred to Casidra, an implementing agent of the Department, to roll out the project. The WCDoA assisted in providing the technical investigation for Casidra’s Technical team under the leadership of the Chief Operations Officer, Kobus Oosthuizen, to prepare and draft tender documentation. 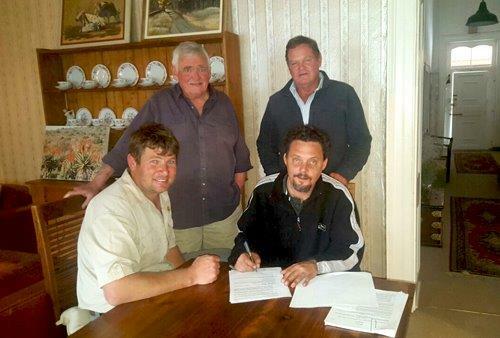 Tenders were advertised and awarded to the successful contractor who happened to be within the Murraysburg community. They will be rehabilitating the current dams by lowering the dams and lasering the walls of the dam precisely. All the supply canals from the weir to the dams will be cleaned and the asbestos pipelines and rebuilding sluices replaced. The valves from the dam will be replaced and the outlet furrows back to the river will be repaired. All the work will be done while keeping in mind the great historical value of the system and where possible original structures like stone bridges will be retained. It was a great pleasure to see the owner of the contract relating to the Rooidam project itself. He felt privileged to get an opportunity to restore and even improve on the Rooidam system, which he remembers from his childhood as a beautiful and tranquil site where the water birds swam and all could enjoy it. He also feels that this is a game changer for Murraysburg. “By greening our town, it will bring back a sense of pride to the people, motivation for all to do their part in making Murraysburg a better community where happy and caring people live”, says Jaco van Heerden. Casidra is currently supervising the construction under the leadership of Kobus Oosthuizen, who is being supported by one of our Senior Project Managers, Jacques Swanepoel. The WCDoA is assisting in providing technical support. The project is welcomed by the community and particularly the MSDC, as the entire project has created jobs and benefitted the community, by restoring a part of lost history in the town of Murraysburg.